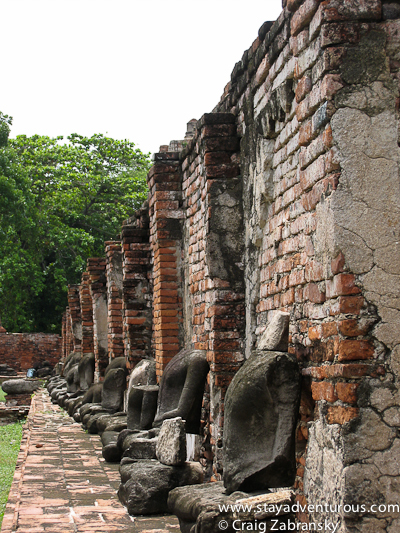 Buddha, perhaps more of a philosopher than a founder of a religion, is ever present in Thailand. The “awakened one’s” way of life still influences the people and culture of South East Asia and everywhere you travel in the “land of the smiles” Buddha seems to be there with you. A statue. A temple (Wat). He’s omnipresent and after a while it is more than comforting, it’s appreciated. You start to smile. On my travels, I took many photos of the iconic figure, and below are a five of my favorite from Thailand. 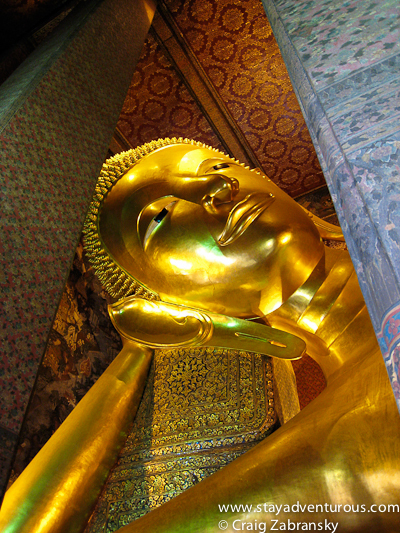 At Wat Pho in Bangkok, the gold plated 46 meter long reclining Buddha remains a top tourist attraction. It’s quite impressive. In Thailand, I learned each Buddha statue represents a different stages of his life and learnings. 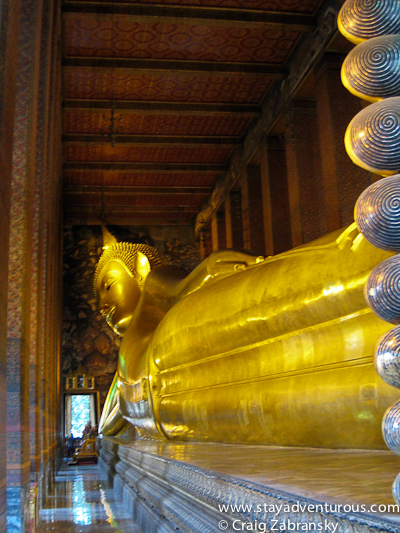 The reclining Buddha commemorates his passage to nirvana. It’s the end goal. 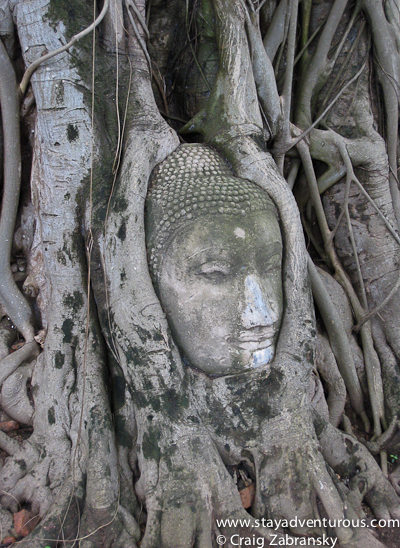 In the old capital of Thailand, Ayutthaya, the famous Buddah head in the tree photo is one everybody clicks. But a walk around the ancient ruins and any photographer will take more than just one. I even attempted to sketch the ruins in my journal (not shown). With the Thai often in conflict with the Burmese (Burma) many of the statues of the Buddah remain headless on the grounds of the city. Why? Well, it’s believed they were used for cannon balls. All is fair in love and war, right? the headless Buddha... not very zen. 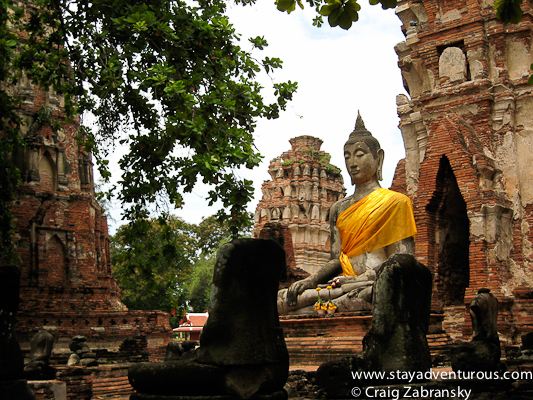 Ayutthaya makes for a perfect day trip from Bangkok. 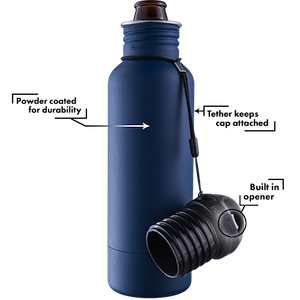 this post is part of the A Taste of Asia series. Thanks. And it seems like you have a signature piece in your Buddha head. I often heard it is a challenge in certain customs to leave with such “artifacts.” Glad yours made it home and makes you smile. Ommmm indeed. Great photos, we loved temple exploring in SE Asia to see all the Buddhas. When you get a chance head out to the zen temples of Japan for a contrast to the huge Buddhas of Thailand. 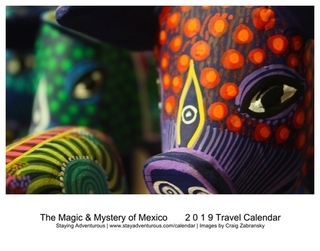 Stunning shots Craig, I just can’t seem to leave the page… too busy sitting in awe. Lovely! Visiting the Jade Buddha temple in Shanghai has always been on my bucketlist. Have you been there, Craig? Great! We were just talking about how we can fly from Australia to Thailand for holidays. It seems so close to us!